Uncovering the latest breakthroughs in blockchain technology. "Bethereum is breathing new life into the world of betting, by combining blockchain and gamification to deliver the most secure and engaging social betting experience..."
In an upcoming episode of Advancements with Ted Danson, the series will focus on how blockchain technology can be used to enable safe and transparent social gaming. This episode is scheduled to broadcast in Q4 2018. Check your local listings for more information. This segment will educate about Bethereum; an innovative gaming platform enabling players to wager on events with other players, without any middleman. Viewers will learn how Bethereum operates as a fully decentralized, secure solution built on Ethereum Smart Contracts. The show will highlight how Bethereum leverages blockchain technology and intuitive design to enable players to create and join wagers. It will also enlighten viewers about the potential for future platform developments, aimed at providing significant advantages also to business operators and third-party developers. Advancements will finally showcase how wagers are carried out using Bether, the digital token powering the entire Bethereum solution. Bethereum aims at redefining the online gaming industry by combining cutting-edge technology with innovative social and gaming elements. 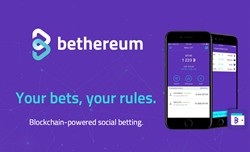 In Bethereum, players wager with friends and other players, not against a bookmaker. Blockchain and Smart Contracts ensure full transparency and security, while superior design and gamification deliver a truly rewarding experience.